Senator Roby Smith is the proud husband to Kari Smith, and together they have four children: Noelle, Kyle, Adam and Natalie. He was raised in the Midwest by two elementary educators. 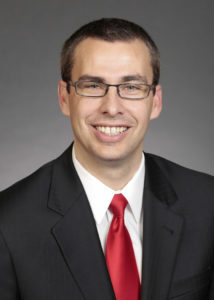 After high school graduation, Senator Smith earned a Bachelor of Science in business administration with a minor in communications from Concordia University. He then worked at a bank for almost ten years and is now a small business owner. Senator Smith and his family are members at Trinity Lutheran Church in Davenport. He enjoys being involved in the community in a variety of ways, such as teaching Junior Achievement, helping with Kids Against Hunger, coaching sports, and serving on the Scott Community College Foundation Board.